KIEV, Ukraine -- Ukraine will press for a third international bailout in four years this week as the former Soviet republic gears up for $10 billion of debt payments and foreign reserves languish near a two-year low. Under pressure from a shrinking economy and an energy dispute with Russia’s OAO Gazprom (GAZP), the government will seek a $15.4 billion loan when an International Monetary Fund mission arrives today in the capital, Kiev. Its last aid package, which ended Dec. 27, was halted for failure to meet the fund’s terms. Ukraine is grappling with falling output of steel, its top export earner, a widening current-account gap and reserves that have fallen below three months of imports. While the government can finance itself in global debt markets at present, an IMF accord is required to put the country on a “sustainable path,” according Viktor Szabo, who helps manage $10 billion at Aberdeen Asset Management (ADN) in London. “They need a deal,” said Szabo, whose fund exited Ukrainian state and corporate debt in November because of the absence of an IMF agreement. The hryvnia has fallen 1.7 percent during the last year to 8.1420 per dollar, prompting the central bank to sell foreign currency. Reserves dropped to $24.5 billion in December from $38.2 billion in August 2011 as the current-account gap widened to a record $12.4 billion in the first 11 months of 2012, when imports averaged $8.6 billion a month. Ukraine must repay $5.7 billion to the IMF in 2013, according to the lender’s website, with an initial payment of $404 million due Jan. 30 and an additional $2.4 billion by May 10. It also has $1 billion of Eurobond repayments due in June and a further $2.2 billion from local bonds issued in foreign currencies. The government will seek a loan equivalent to about $10 billion Special Drawing Rights, or SDRs, the same amount it agreed on in 2010, according to First Deputy Prime Minister Serhiy Arbuzov. “We want to discuss those figures and conditions that were fixed in the previous loan program,” he told reporters Jan. 14. While Ukraine complied with IMF demands to raise the pension age, it refused to increase domestic heating tariffs, a condition designed to narrow the budget gap, resulting in loan disbursements being frozen in 2011. Efforts toward an alternative solution -- trimming the price of natural gas imports from Russia -- have been unsuccessful. Gazprom is demanding $7 billion for Ukraine’s failure to take contracted volumes of the fuel in 2012. The government may raise utility tariffs for the wealthy, Premier Mykola Azarov said last week, without providing details. The Washington-based IMF, which sought an across-the-board price increase of 30 percent or more in 2011, has suggested that scrapping untargeted benefits for the rich may free up funds to help offset the cost of higher tariffs to the poor. While gross domestic product may have advanced 1 percent in 2012, according to the government, the economy probably shrank in the second half because of lower metals prices, HSBC Holdings Plc (HSBA) and Erste Bank Group AG (EBS) estimate. GDP is set to contract 1.8 percent this year, Goldman Sachs Group Inc. (GS) said Jan. 24, contradicting Azarov’s forecast for 3 percent to 4 percent growth. Industrial production fell for the first time since 2009 last year, dropping 1.8 percent after a 7.6 percent jump in 2011 as metals output plunged 5.2 percent, official data show. Fourth-quarter GDP data are scheduled for release this week. Ukraine sold $1.25 billion of 10-year Eurobonds Nov. 20. The yield on that debt declined to 7.324 percent yesterday, the lowest level since it started trading, data compiled by Bloomberg showed. 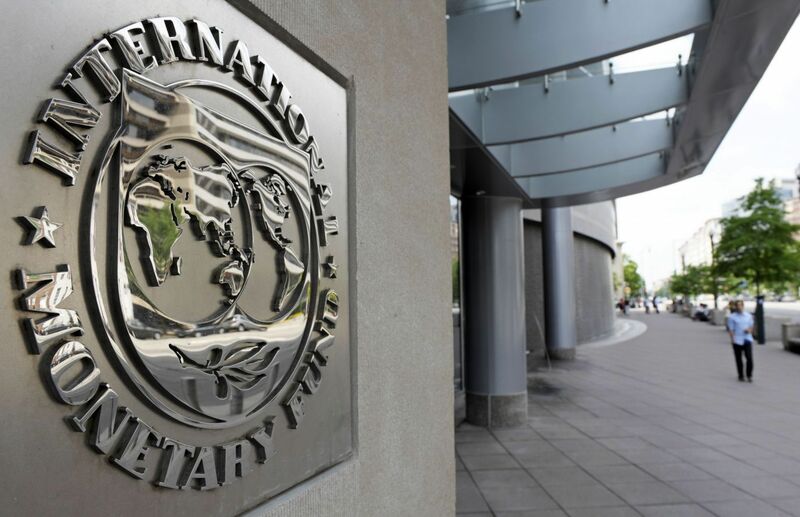 Access to international debt markets may be “a double- edged sword” that may steer the country away from an IMF pact, according to Andreas Kolbe, a credit strategist at Barclays Plc’s investment arm in London. “The availability of financing is likely to reduce the incentive for the government to implement unpopular reforms required to come to an agreement,” he said. The cost of insuring state debt against non-payment for five years using credit-default swaps has fallen to 572 basis points from as high as 803 in July, according to data compiled by Bloomberg. The IMF delayed a planned Dec. 7 visit to Kiev as President Viktor Yanukovych picked a new Cabinet and central bank governor after October’s parliamentary elections. Moody’s Investors Service and Standard & Poor’s later cut Ukraine’s credit rating one step on weak economic prospects and significant external financing needs, and said further downgrades may follow should talks with the IMF fail. Moody’s rates Ukraine at B3, six levels below investment grade. S&P rates it one level higher at B. While Ukraine is attempting to delay an IMF deal for as long as possible by tapping bond markets, it will eventually have to reach an agreement with the lender, according to Andrew Matheny, an analyst at Goldman Sachs in Moscow. “In employing this strategy, the government is accumulating more debt, at a higher cost and in foreign currency,” he said Jan. 22 in an e-mailed note.